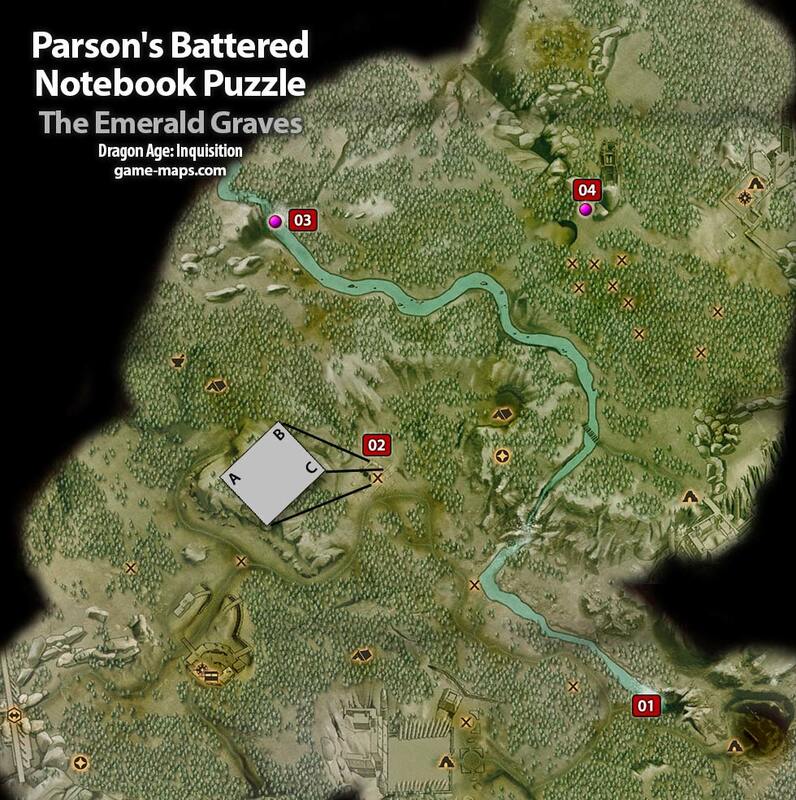 Parson's Battered Notebook - Lions Pavilion Torches Puzzle - Dragon Age: Inquisition Walkthrough, Game Guide and Maps, with Quest and Locations of Camps, Merchants, Rifts, Ocularums, Astrarium, Dungeon Entrences, Landmark (POIs), Crafting Station, Mosaic Piece, Inquisition Agent, Secrets, Party Members, Bottle of Thedas and Codex Entry. This Puzzle starts with Parson's Battered Notebook. I don't know what it means. Is it allegory? I don't even know where Father got this... mess of rambling. He spent his whole life figuring out that it pointed to objects in the Emerald Graves, and now I have to finish the job. This is going to kill me. Why would his dying wish be that I figure it out? What sort of father asks that of a son? 1. Here is my soul, trapped in a cage of bone. 2. Here is my past, forgotten in the bleak winds. 3. Arching above outstretched wings. Even stone can rise. 4. But the sky is a cruel mistress, and wants for my life. 5. A goblet of my blood, on a table of ashes. Where can eye stand? 6. Turn around, face the shadows. Do not blink. 7. Halls of whispers carry secrets even the moon does not know. 8. Roses and daisies for her love. Where he stands, no one can fall. 9. Dragonslayers, four at the northwest, two from the northeast, three from the southeast. 10. They begged mercy from the woman crowned with grace and stars. 11. Cannons at her head, mountains at her feet; she is the mother of Faith. 12. Beyond Andraste's Mercy, a hundred steps to revelation. 13. Cradle the cat on a sling of silk, and say "Never will the dove call more." 14. An upward pointing finger, there your heart lies. 15. But the spear pierces the eye of the tiger, and the prey is the hunter. 16. Blades of glass beneath my feet; I walk the path of the flame. 17. Beneath the stones of sacrifice, find the truth. 18. On the back of the wind. 19. In the palm of fortune. 20. At the first breath of sighs. Which ones to ignore, which to keep? Then go to center and pickup clue "20" is penned in red. Pick Secret under waterfall: The number 14 is embossed all over the last cube. NPC: Treasure 19 lvl Elite, kill it.